The Coast Ranger is for sale for the first time to the general public. The Coast Ranger is a custom built 48 foot headquarters' patrol ship. The ship was built by the B.C. Forest Maintenance Depot in Vancouver. The Coast Ranger is a professionally designed and constructed from yellow cedar carvel planked over bent oak ribs. The ship is fitted with a steel bat-wing and weighted keel. There is a hydraulic anchor winch on the foredeck with 100 ft. of heavy chain and 350 ft. of ½ in wire rope.... great for halibut fishing on Swifture bank. There is an a-frame mast stepped to the deck. The boom has two hydraulic winches. The ship was built in 1967 and re engined in 1978 with a Detroit 8v92 240 hp. engine. The ship has an Isuzu 9 kw gen set 2005, a hot water boiler which supplies heat to all areas of the ship. The sewer system meets code and has a vacuum flush toilet and full size shower with a holding tank. This ship is in Bristol condition it needs nothing. The fuel tanks are full ready to go to Alaska or Haida Gwaii . Both the house and 12 volt systems batteries are new. It is all set up for fishing with electric down riggers, prawn and crab traps with a hydraulic puller. I have this year's out of water survey and it has new bottom paint and zines . I have owned the ship since it was retired ten years ago and have been all over the coast cruising in comfort. Why spend 250 thousand dollars on a sports fishing boat that will rattle you fillings when you can travel and fish in comfort? The ship has all modern electronics, cruising spares, tools and is turn key. 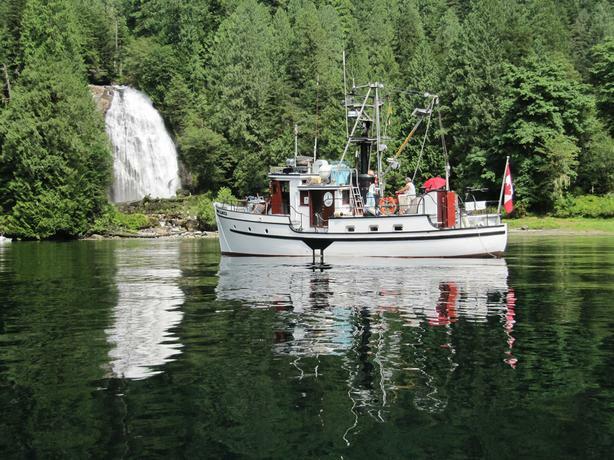 It has a beautiful galley full size fridge, freezer and a Dickenson Atlantic diesel stove. Please call if interested rick 250 466 9072 too many features to mention. The ship is moored at a dock in Maple Bay. Buy your self a real Christmas present.